Waiting for you at the Florida Tow Show Now! By Danny@Matheny, April 11 in Miller Ind. Swing by and say hello at the Matheny booth #812. Call me if your around to meet up 757-927-0457. Also, there are some real nice trucks here at the Miller booth. 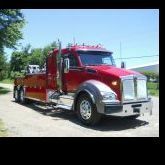 here at Matheny we have plenty of trucks available and on order.